Winemaker’s Notes: Pale yellow color with green hints. The wine exhibits citrus aromas (lemon, grapefruit) with smoky notes. Fresh and very aromatic attack. The palate is round, with great acidity (coming from the later ripening sites at a higher altitude). A lot of freshness on the finish mixed with salty notes, which express the minerality of the wine. My Review: I’ve been getting to try a lot of French wines lately. That’s not a complaint. 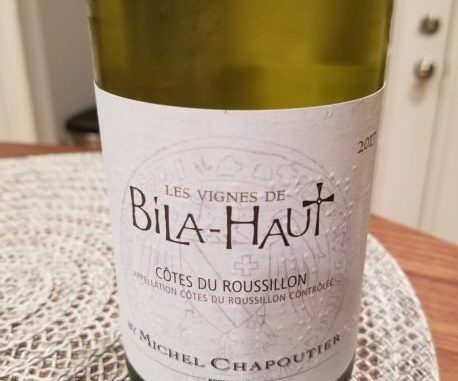 I’ve gotten to try a lot of Michel Chapoutier wines over the years, and I have to admit, this and the Rouge I wrote about recently might be some of the better bang-for-buck wines I’ve had recently. In the glass the wine was a pale yellow color, and on the nose I picked up aromas of lime and apple. On the palate the citrus and apple carried through, with a touch of saline and mineral in the mid-palate leading into a nice clean finish. My wife and I paired the wine with chicken in a cream sauce, and the crisp notes of the wine were a great counter to the richness of the meal; a pairing I would recommend and would do again. Like I said at the top, I really thought this wine was a great value. At $15 it’s certainly not over-priced, but it’ll show well at dinner and holiday parties as we make our way to the end of the year. If you’re looking to stock your wine cabinet before friends and family come over, you’ll do fine with this.